Lindy Exchanges: Dance ’til You Drop – Swing or Nothing! 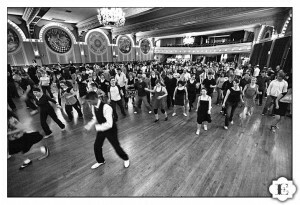 I just returned from a great dance weekend at the 2011 SLO Lindy Exchange in San Luis Obispo, but must admit that I was slightly sad that I didn’t see more San Francisco dancers down there this year. Perhaps it’s because our newest generation of budding Lindy Hoppers have yet to hear about the amazing dancing and late night bliss that happens at exchanges….we’ll let’s fix that right now! What is a Lindy Exchange? A Lindy Exchange is most often a weekend-long dance event in which travelling dancers visit a hosting city to experience the culture of the local dance scene and community. Exchanges usually feature nearly non-stop dancing that includes daytime outdoor dances, evening balls with live bands, and the infamous Late Nights – after hours dance parties that go from 12 to 4am or later! Local dancers usually host visiting dancers in their own homes. Many exchanges highlight local and regional live music and DJ talent, while those that can afford it fly nationally renowned DJs and bands to headline their events. The biggest lindy exchanges — such as those hosted in San Francisco and New York — can draw upwards of 500 dancers from around the world! In addition to dance events, exchanges often feature daytime activities like walking tours, scavenger hunts and other games to help visitors get to know their city and people in a unique way. The first lindy exchange, ‘The Weekend’, occurred on December 4–6, 1998, in San Francisco, California. 19 dancers from Chicago, IL traveled to San Francisco to spend the weekend experiencing the dance styles and established venues in the City. Not long after, a like minded group of San Francisco dancers traveled to Chicago to experience dancing there. Thus the exchange was born. As Lindy Hop grew in popularity, the Lindy Exchange concept evolved from a city-to-city swapping of dancers to an open-invitation gathering of dancers in a designated city. Seattle was the first city to use the term “Lindy Exchange,” and the LindyExchange.com website which was used to promote that event soon became a hub for news about upcoming exchanges. Nowadays, there is a Lindy Exchange happening somewhere in the world on almost every given weekend, and many cities host annual Lindy Exchange events. Why should I go to a Lindy Exchange? dancers who travel to exchanges are often just as enthusiastic, passionate and geeky about dancing as you are! Late Nights! Dancing past midnight when your body is exhausted sounds rough, but can be absolutely divine! By that time, you’ve had so little sleep, and been dancing so long that your body and mind finally, automagically relax – just like your dance teachers are always harping on you to do – and you start dancing and discovering new movements that you can only dream about doing when you’re in a fully conscious state. Pure bliss! It’s a great way to get out of town, take a vacation and experience a new part of the world in a unique way! You’ll be helping spread the joy of Lindy Hop and cross-pollinate dance ideas around the world! Sounds cool! When’s the next one happening? How do I find out more? Register and pay early — as soon as you know you want to go. Event pricing usually goes up as the exchange date approaches, and there are often limited numbers of Ala Carte tickets to individual dances. Recruit your local dance buddies to travel with you, especially if it’s your first time. The added safety net can make breaking into a brand new scene a lot easier. Plus it’s fun to compare dance notes with your friends…they’re sure to fill you in on who all the must-ask-to-dance personalities are! Use sites like Kayak.com to search for low airfares to your destination city. Some people pick their exchanges based entirely on where they cheap flights take them! If your job allows it, take the Monday after the exchange off to recuperate. You’re sure to be a zombie after all that dancing! Pack plenty of fresh shirts, deodorant and a towel to wipe off. Also, multiple pairs of dance shoes for dancing on a variety of surfaces.